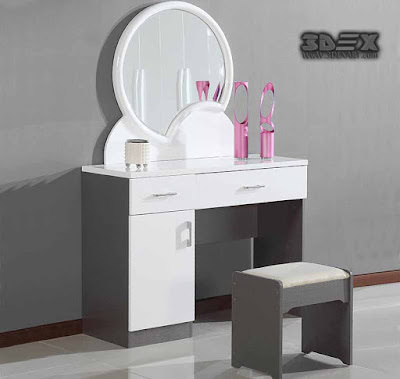 The dressing table is the equipped place where you do your make-up and hairstyle. 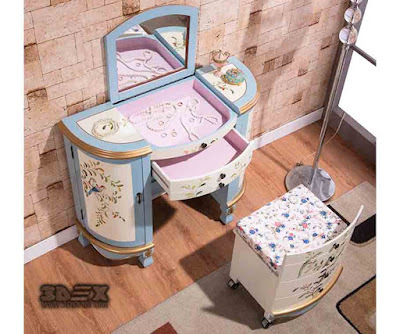 This is an inviolable women's territory, where jewelry, cosmetics, and just lovely things are stored. While Planning the interior of the small bedroom, each woman will definitely allocate a corner for herself, where she will devote time to beautify herself. The key item in this corner, of course, is a dressing table design for the bedroom. By the way, you can use it not only for doing makeup but also for working with a laptop. 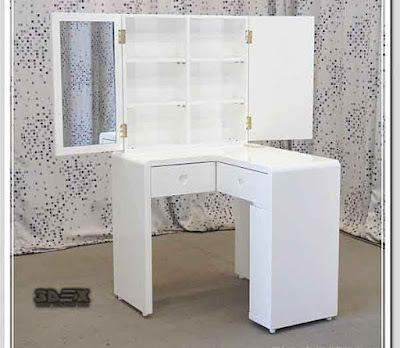 This is a kind of working mini-cabinet for a woman. Therefore, it is so important to create not only beautiful but also convenience in this zone. 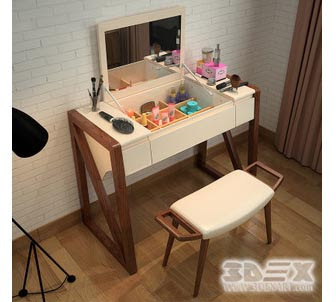 Take care of the makeup table lighting. If there is not enough natural light, connect more lamps on the mirror perimeter or above it. Next to the small dressing table for the bedroom, there must be at least one outlet. 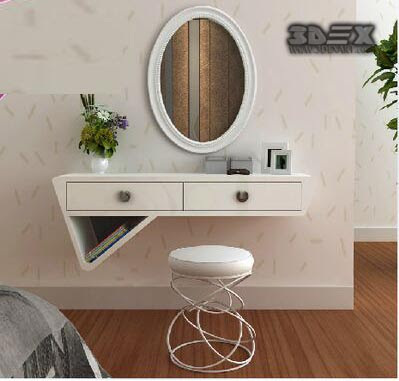 The size of the mirror should match the size of the table. The height of the small dressing table design and the seating position should also be in harmony. It's a bad idea to put the small dressing table in front of the bedroom window. Not only that the face will always be darkened, and this is unlikely to contribute to applying neat make-up, so also the mirror will give glare. Ideally, the beauty zone should be next to the window. If the layout does not allow this, install a special backlight. 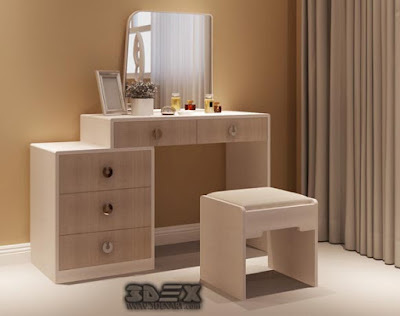 The standard of the height of the dressing table in bedrooms is 75 cm, but you can choose another height "for yourself". For sitting, choose an armchair, pouf or a banquet. 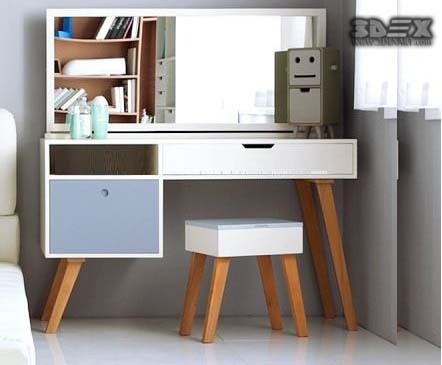 An important point here is the size of the dressing table design: if the model is compact enough, it can be pushed under the table. 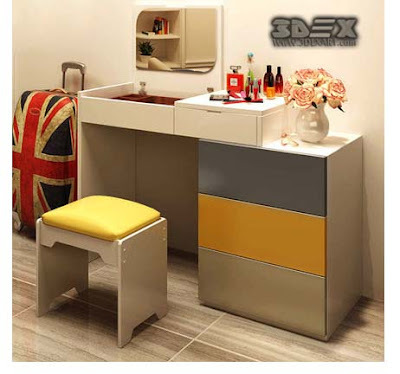 However, it is problematic to sit out for a long time without a backrest, therefore it is better for ladies who spend hours to choose a chair with a backrest. Pay a special attention to organizers, stands, and holders. 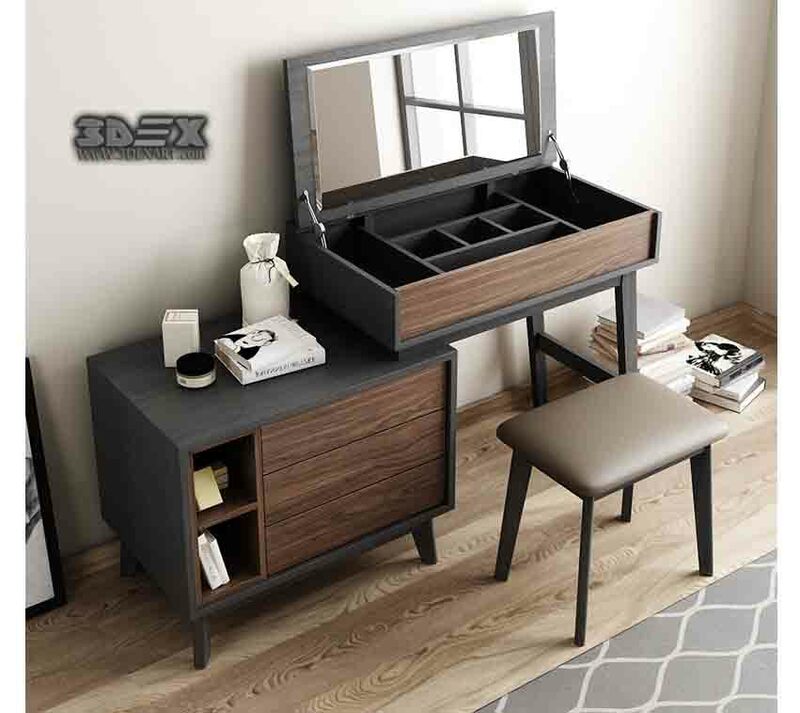 They will help keep the small dressing table clean and tidy, plus the comfort. 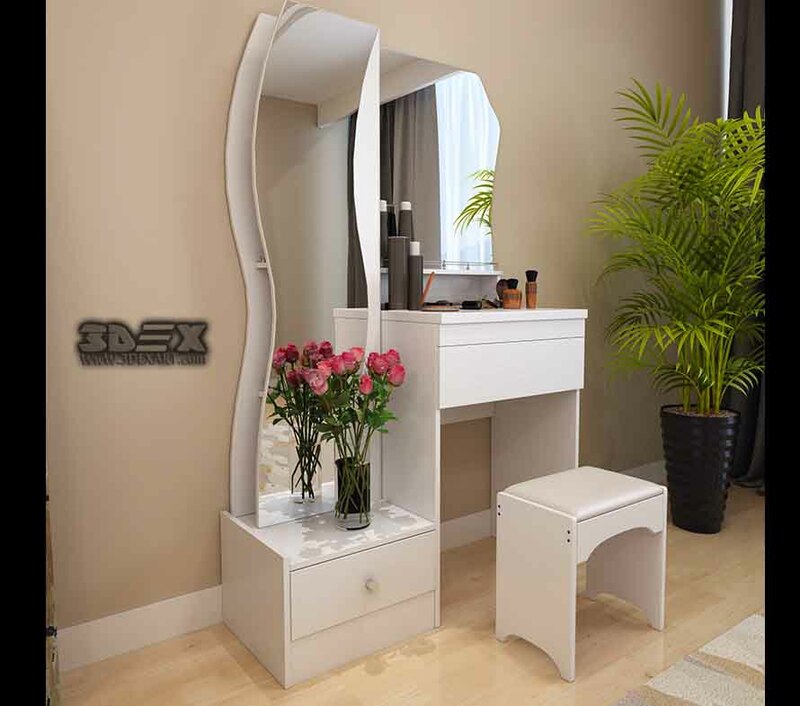 The small dressing table should fit into the overall picture of the small bedroom in the style and color scheme. 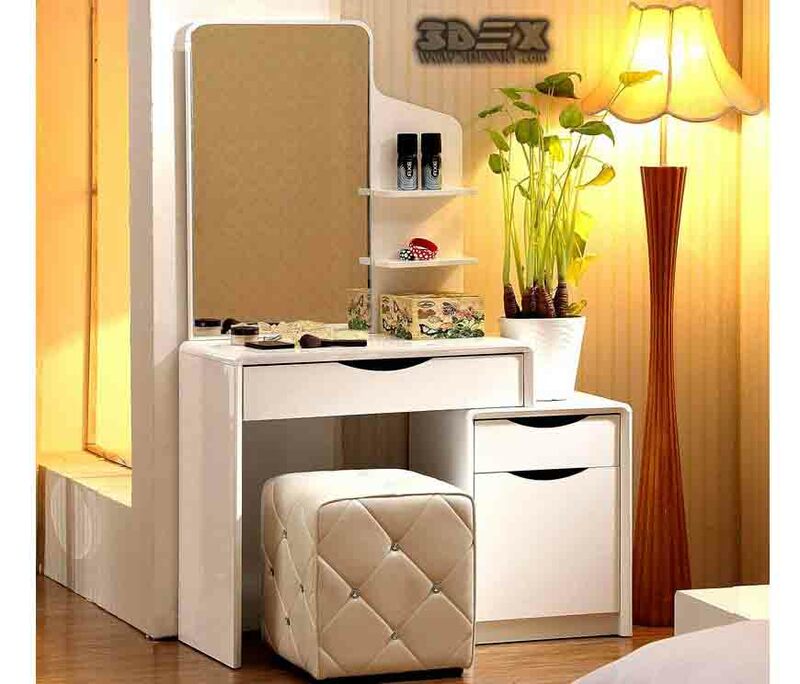 In addition, the beauty corner should be in a room where a woman can be alone with herself. 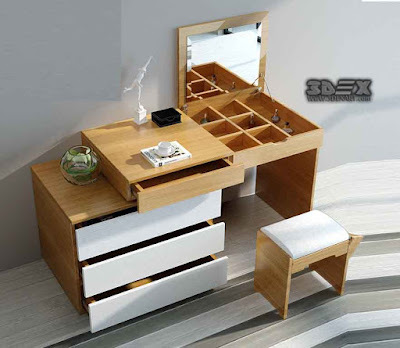 Most often a dressing table is placed on the woman side of the bed, but this is not an iron rule. Before you make a purchase, determine in which style your bedroom has been designed, then choose the most suitable option. 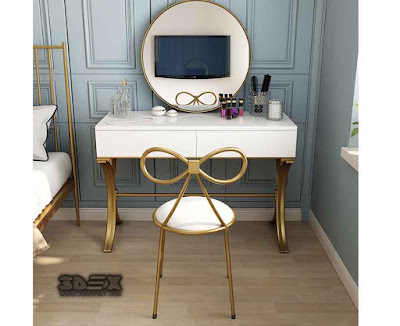 The best place for a small makeup table is a bedroom. This is a quiet room, hidden from prying eyes. 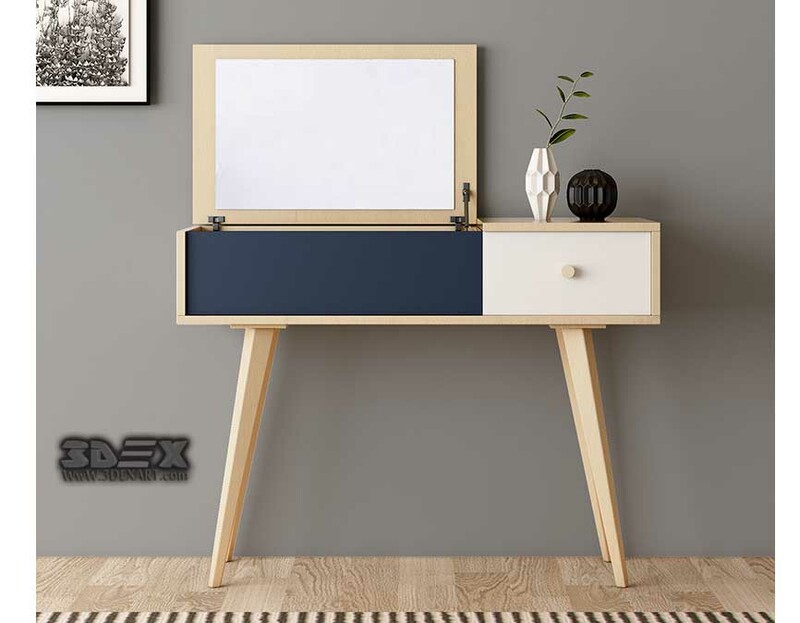 If you choose the ideal option for color, style, and functionality, you can find a personal rest. 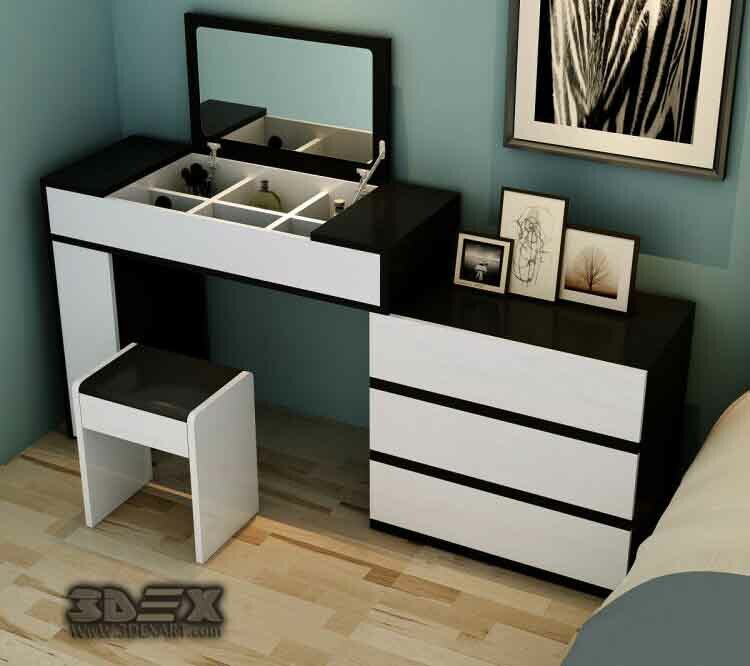 For a small bedroom pick up a compact dressing table design. 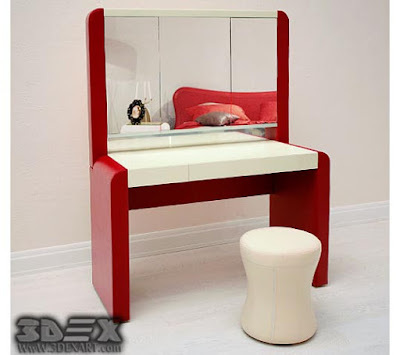 A similar variant can be executed in the form of a folding table and a wall mirror. Solve the problem of lack of space by placing a small dressing table design instead of one of the bedside tables. 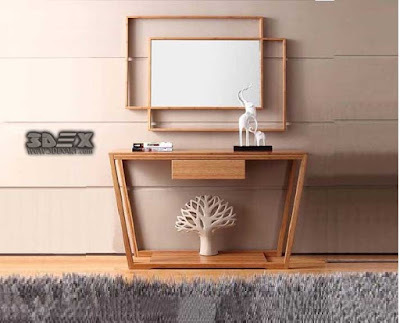 Another good option - a miniature table with a narrow table top and a wall mirror. 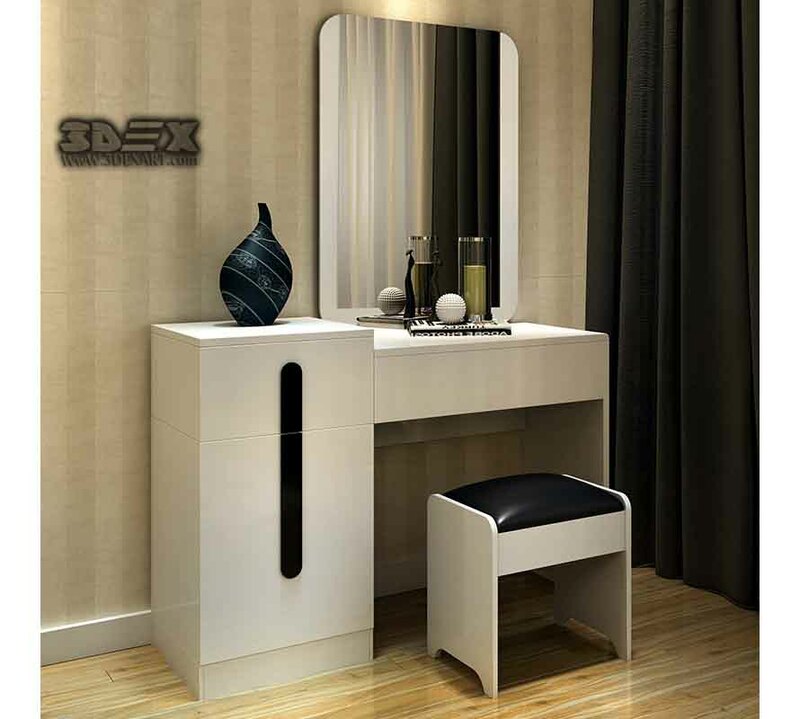 A large mirror in front of the window visually widen the room, for example, mirrored cabinet doors. 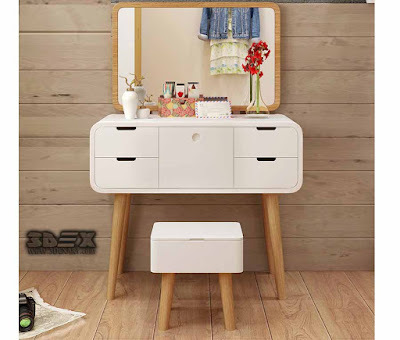 Small dressing table designs for other rooms? 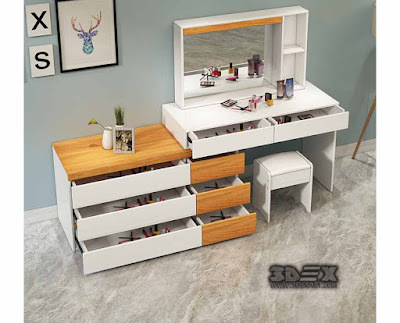 An alternative to the bedroom can be a dressing room. This, of course, applies to owners of spacious apartments. In this situation, it is better to have a trellis so that you can view the outfit, and then do make-up clearly. 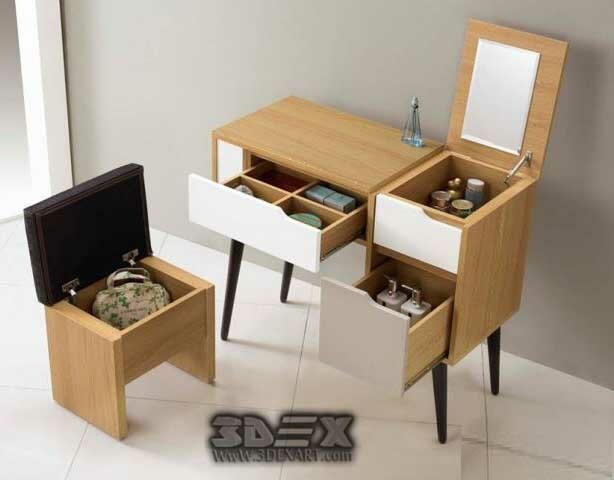 In the hallway, you also can place a very small dressing table. It is important to remember that this room, which does not have natural light sources, therefore will require a particularly careful approach to the arrangement of fixtures. 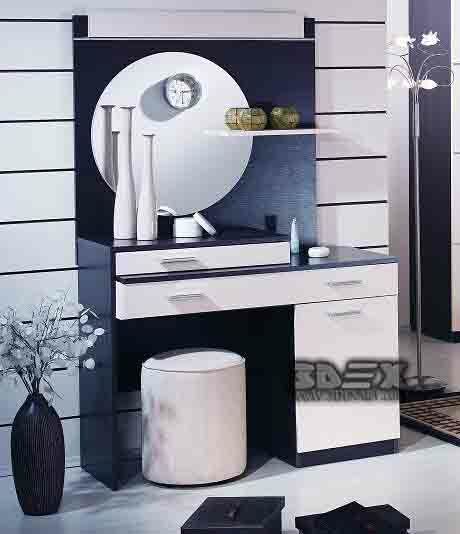 In addition, do not forget about the direct functional purpose of this room. In houses with a large bathroom, there is a place for the location of the small dressing table with mirror. This is a room where a high level of humidity is constantly maintained so not all furniture will withstand such conditions. 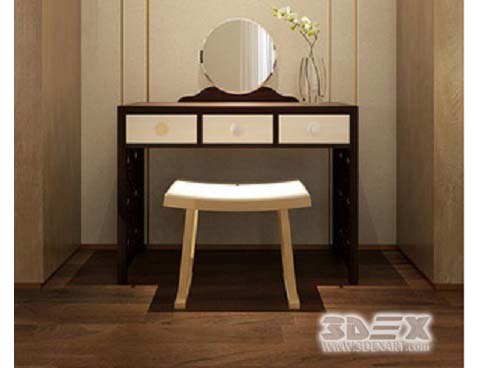 However, there are such types of wood that are dampness resistant, for example, wenge or hevea. Wenge has a dark, almost black hue, and the color range of Hevea ranges from gently pink to brown.